« SURPRISE Wedding for Friends! We are big sleepers in our family. Always have been. Lola has been a wonderful sleeper since she was a baby, partly because it was something that we always nurtured because we love sleeping and weren’t big on the whole night-waking thing or the pre-bedtime breakdown thing. Those are things, trust me, and they can consume you. Not that we have perfected anything parenthood related, but I like to think we have created a pretty great little sleeper through consistency, but also in creating a bedroom for her that beckons at bedtime and is generally a place she wants to be (and sleep) in. I have four tips on creating a cosy space for your wee one that promotes sleep while encouraging play, while being easy on the eye too! 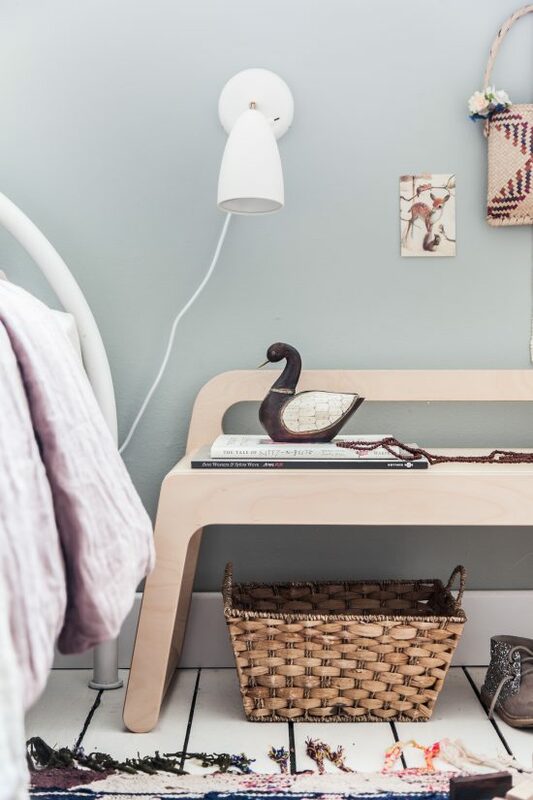 With a few simple elements to incorporate into your little one’s space for function and comfort, I am going to share with you my secrets on creating a cosy little nook your little one will adore and be proud of. Lola literally spends hours in her bedroom, alone or with a friend, doing everything from quietly colouring, flipping through books, playing with blocks or doing a puzzle. Not only that, at the end of the day, she is happy to turn in and apart from wanting mama to snuggle in with her most nights, has no trouble falling asleep. 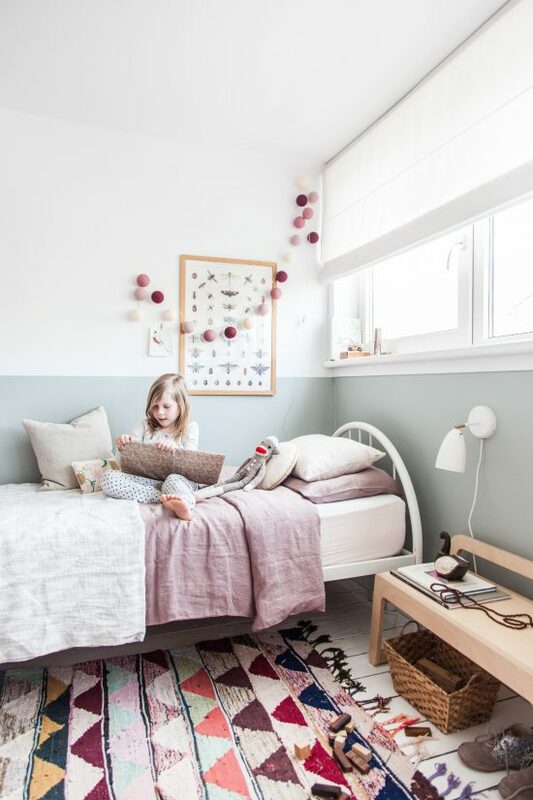 Hers is a wonderfully balanced space that not only encourages play but also promotes sleep and I would like to share with you the things I have found to be important during my decorating journey. A good sleeper starts with a good mattress and a comfortable bed. You can’t expect your little one to look forward to bed time when the main ingredient (the bed) isn’t cosy, but above all, comfortable. Kids need a firm mattress from the get go. Lola has an Eve mattress that we all love. Yes, I end up curling up with her most nights after story time. Bad, I know! But it’s too precious and I simply can’t help it! The little conversations we have right before sleep time are what I treasure most in this world so I figure I’ll just make the most of this lovely time and not worry about confusing her. She’s nearly six after all, and our bed time routine is so solid that a bit of weakness on my part isn’t going to make or break the structure. Anyway, the mattress gets delivered in a box and just springs to shape, ready to sleep on in minutes. It is firm but soft, making bed time tempting for both of us. Clearly, Lola and Mr Buttons were very excited when the bright yellow Eve arrived, mostly because they were permitted to jump on the bed to celebrate the occasion! If bed time is for sleeping, then everything around the bed should work to promote that and aid in assisting you to get your little sleeper off to the land of nod without too many distractions. 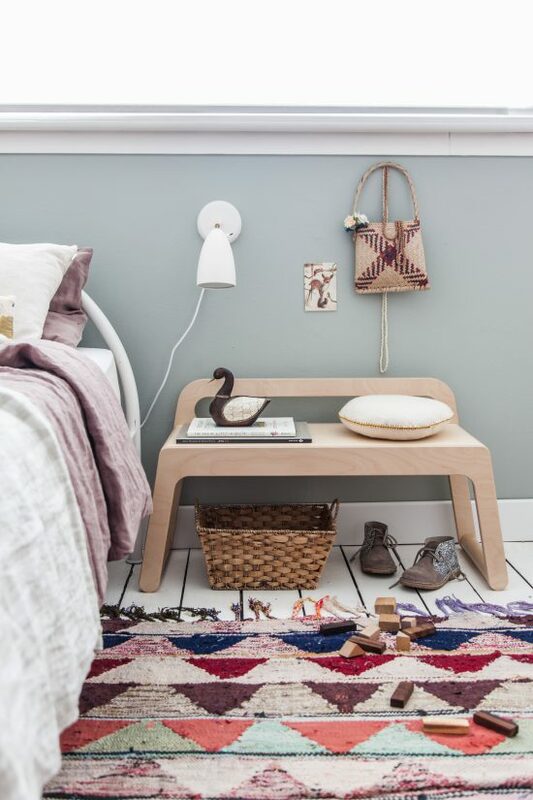 This little bench by Rotterdam-based kids furniture design label Rafa Kids is perfect for storing our favourite story books so we are ready to go at bed time, and can also double up at her writing desk when a friend comes to visit and we need more than one seat! I love the simplicity of the design and the many functions it offers. One of the most important elements of designing every space in the home, lighting plays a key role in the way a space is used and enjoyed. 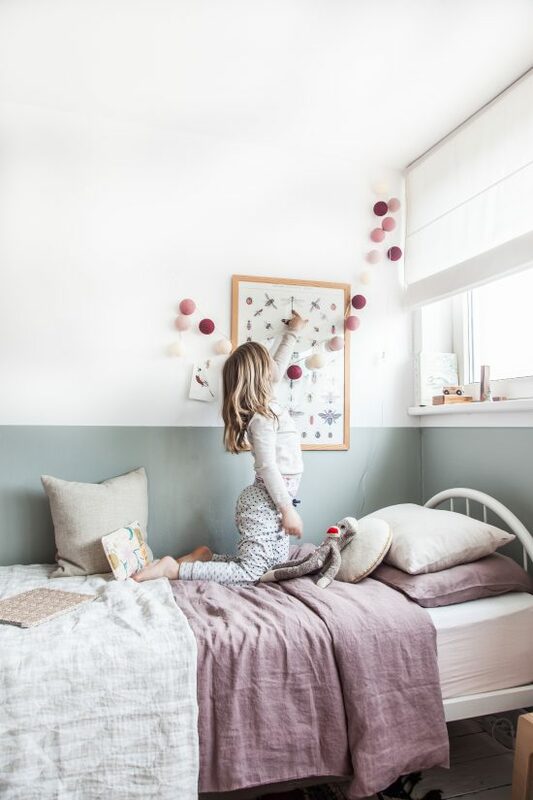 For a kids space, natural light is wonderful for playing in, so if you’re lucky to have big windows like us, then fling open the curtains or blinds to let the natural light to flow into the room. 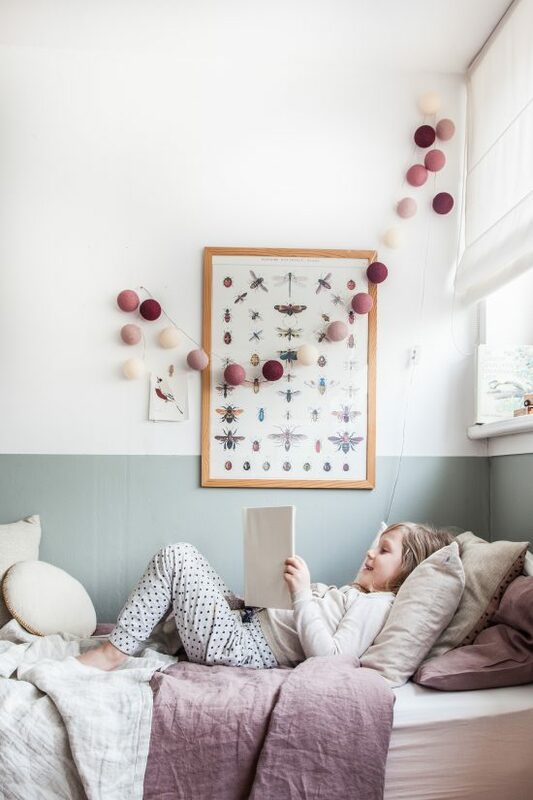 For bedtime, though, you need two things: a reading light for bedtime stories, and a soft night light (for kids who don’t like sleeping in complete darkness). 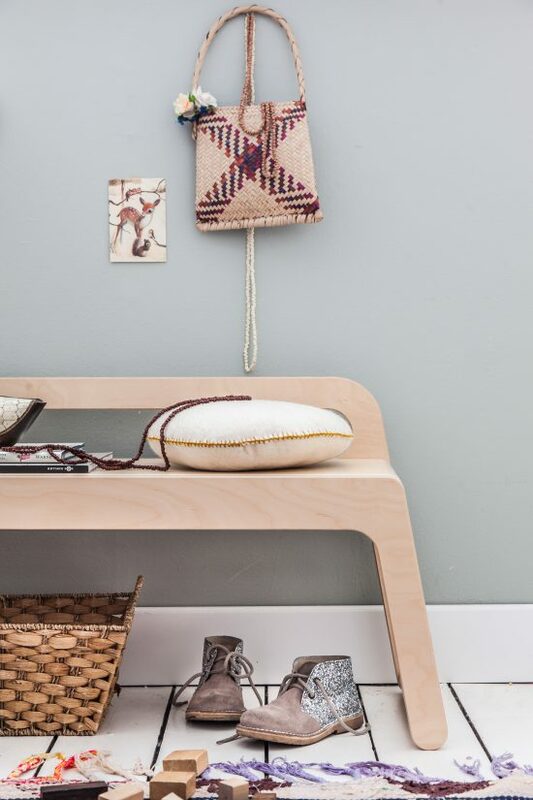 Next to Lola’s bed is a neat little wall sconce with a multidirectional head that illuminates the page of the book we are reading. 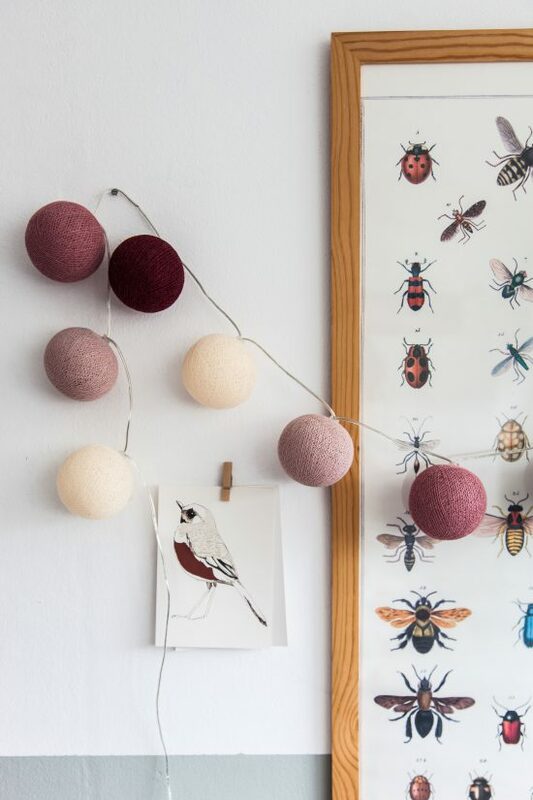 When it’s time to hit the hay, we use a string of cotton ball lights that gently light the space so she can drift off to sleep under their soft glow. They are as pretty as they are practical, which scores high in my books! Perhaps one would argue that textiles aren’t so functional, but they play a very important role in not only how a space looks but how it feels. 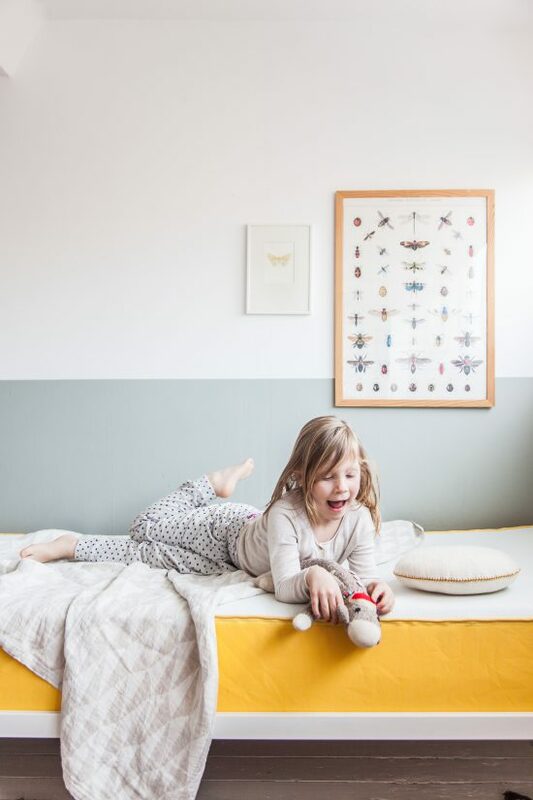 Kids need a soft place to land their head, knees or bums, and what better way to do that than with fun textiles in lively colours that look inviting while enabling and promoting play and rest. On the bed, textiles are important because they influence your child’s temperature at night – kids get very hot while they sleep – and ensure their comfort. I love using 100% linen on the bed because it regulates your temperature (they stay cool on hot nights and are very warm on cold nights) and they are very comfortable to sleep in. Polyesters will get too hot casting your little sleeper to wake in a puddle of sweat. 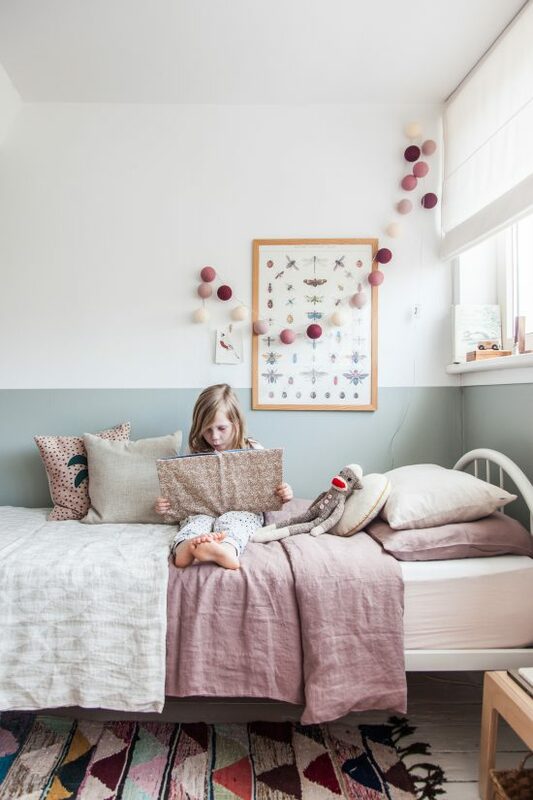 That’s not to say functional doesn’t have to look great – I love the dusty rose shade of this linen from Rafa Kids paired with her brightly coloured vintage boucherouite rug (mine is from Pink Rug Co. on Etsy). 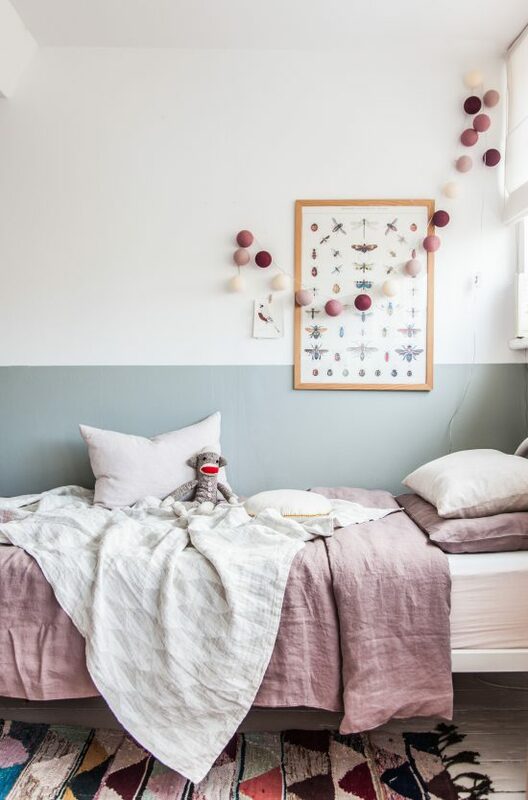 Vibrant pillows from Fest Amsterdam combined with a neutral linen throw from Rafa Kids keep the balance between fun and calming. 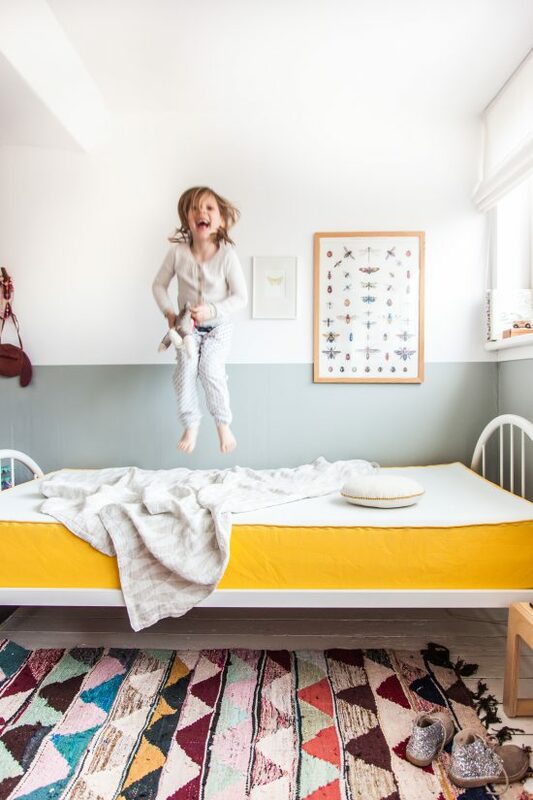 Which is just what you want in your little one’s space – for them to have fun and be energetic but at the same time be calm and enjoy bed time as they turn in for the night. Spot something you love? 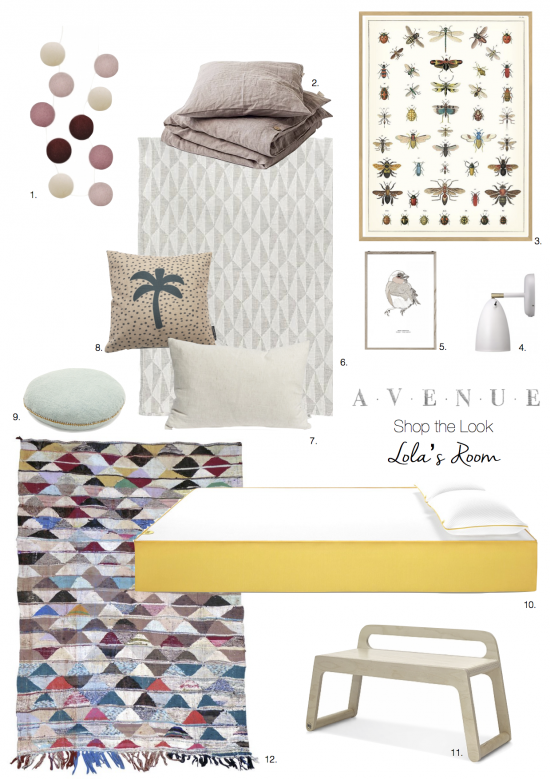 We’ve got you covered with another ‘Shop the Look’ below with most of the items in Lola’s room to be found online. 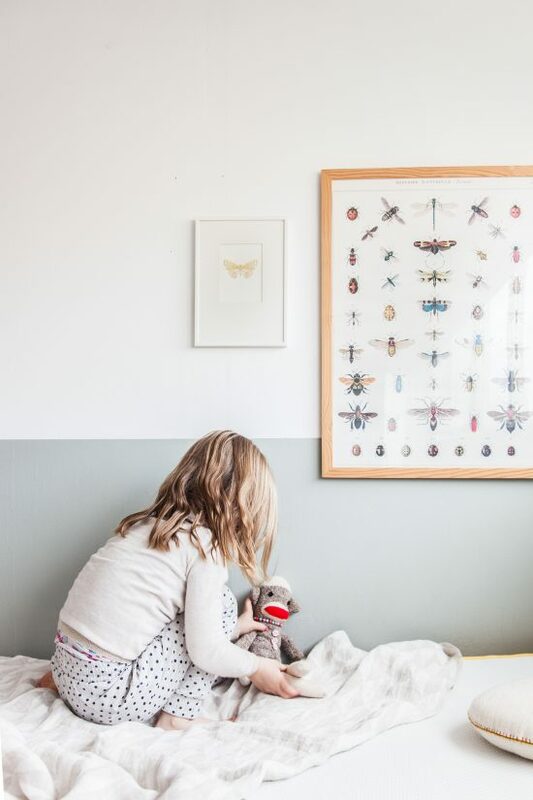 Decorating for your little one is as much a puzzle functionally as it is fun picking out cute pieces, and I hope today’s post has helped you to make smart choices that promote sleep as much as play, to strike the balance between fun and calm. Tomorrow I have a BIG announcement for you – a secret I have been keeping for the last six months that has driven me mad but at the same time given me so much energy and excitement I could almost burst! I can’t tell you what it is right now, so you’ll just have to come back tomorrow. See you then! Such a lovely room! Could you please tell me the name of the mint colour used on the walls? What a perfect place for our children to stay. And a perfect solution for our sleeps. Thank you so much. Hi Holly! Gorgeous room! Where do you get those weaved baskets under the bench? Perfect for storing toys. Hi! What a beautiful room! May a ask where the nice carpet is from? Love the room and colour scheme. Can I ask where the Roman Blinds came from because of their simplicity !